Guitar-Nerdery 045 exceptionally one day earlier, today on wednesday 9pm! It's the final episode before a short 2-week spring break! The next episode will be realeased on may 09. Very often when I wanna motivate my students not only to reproduce something someone else has played, but to improvise, the desperate response is "I really don't know what to play, how to begin'. A very common way of starting with playing solo guitar is learning an easy scale shape, like the pentatonic or blues scale. Playing it simply up and down first is good to memorize it and for doing the sports. From the musical point of view it's pretty boring. In this video I show you an exercise that's very musical and effective which works on all levels. It's completely up to you how difficult you want to make it. I wish you all a nice spring time! I've already made a couple of videos about Al Di Meola's strumming technique. 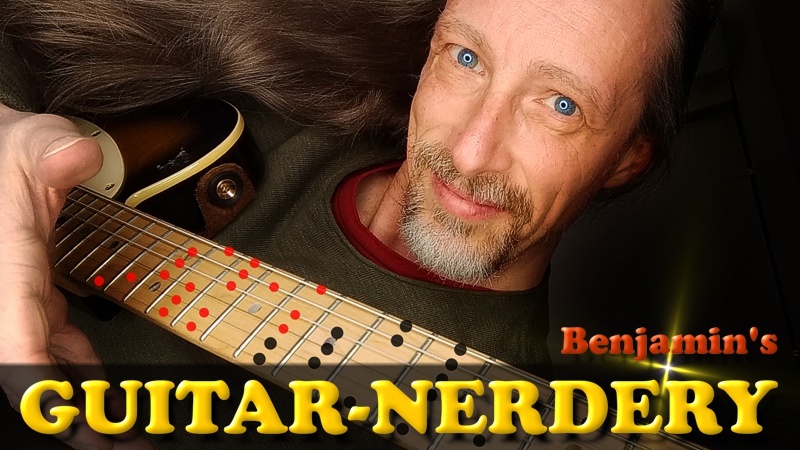 This time I wanna refer to the very first one, Benjamin's Guitar-Nerdery #020. In the demonstration intro clip I've improvised with a simple chord progression and tried to apply Al's style and approach of strumming guitar. After covering some important ingredients of Meola's strumming style I thought that learning this intro demonstration could be a good start, if you struggle to come up with own ideas and don't know how to begin. In this episode I'm gonna explain all chords and grooves in detail, showing them slow and fast. Have fun with practicing! Al Di Meola's trademark when he plays rhythm guitar are his very fast 32nds fills. In this video I'll show you a bunch of guitar strumming exercises which will not only help you to build up speed, but to be able to switch between 16ths and 32nds in a split second and very accurate. If you really want to dive deep into Al Di Meola's playing style, you can't avoid such a training! In this video I will again cover the Al Di Meola rhythm guitar topic and show you my approach to his strumming technique. Very often he uses different strumming patterns to get life and dynamic in a groove. Video #029! Today I stick to alternate strumming, show you a transparent sounding chord type and use it to demonstrate how dynamic in strumming can be achieved. Not only by hitting the strings hard or soft, but to split the chord by frequency into two parts, low and high. There have been already 9 videos under the subtopic Adapting guitar techniques within my Guitar-Nerdery series. This one rounds it up to number 10. Adapting hybrid picking to Yngwie Malmsteen's lightspeed sweep-arpeggios is my crazy challenge this time. What we get is a great hybrid picking workout. Under the roof of my Guitar-Nerdery series I'm going to post jamtracks every now and then. This one is in the key of F# dorian. Dorian is the second mode of the ionian system, in this case the E ionian system. The much more common minor mode used in rock and pop music is the 6th one, the aeolian mode. Compared to aeolian, dorian has a major 6th! Just one note different, but a great change of 'flavor'. I've made an effort to let this backing track rock and groove. You can use it for a whole lotta exercises I've showed in my Guitar-Nerdery series. Have fun! Neoclassical Metal - what would that be without Yngwie Malmsteen! Today I'm adapting hybrid picking to one of his trademark licks which will enrich your shred guitar vocabulary. You'll be amazed to see how hybrid picking really matches with that style and makes it possible to extendend this fine lick. I've prepared a very broad lick for you to sink your teeth into. An awesome picking training, based on Malmsteen's idea or actually on the music of the baroque era. Neoclassical Metal! That metal style came up back then in the 80s and Vinnie Moore had lots of licks to show which fitted into that genre, which are directly inspired by the music of the baroque era, by J.S.Bach, Vivaldi, Händel, Telemann etc. In this video I'm adapting hybrid picking to one of them and you'll soon understand, that this technique makes it much easier to play compared to alternate picking. I also extend that lick from the original and show you how to play it everywhere on the fretboard! Last week I showed you an adaption of the tapping technique in the style of Greg Howe to an alternate picking exercise / lick of Vinnie Moore. I found it also interesting and it's also a guitar technique adaption, to show you one more tapping exercise. Scale Tappping! If you, instead of learning just tapping licks, apply the tapping technique to three note per string scale patterns which you use to improvise solos, you enable yourself to improvise with that technique. #036 Adapting Guitar Techniques 06 - TAP the HELL out of it! This time I'm again referring to my Guitar-Nerdery episode nr. #033 and apply guitar right hand tapping technique to that idea of Vinnie Moore. What we get then is an awesome sounding, fast shredding lick in the style of Greg Howe! ...Greg Howe, a six string virtuoso with an incredible guitar tapping technique. This is another episode where I combine hybrid picking and legato technique. It's a consequent follow-up of Guitar-Nerdery #033, hybrid meets legato. There I took an exercise of guitar player Vinnie Moore ( Shrapnel records artist, member of U.F.O. ...) that was originally meant for training alternate picking and applied left hand legato technique (hammer-on's and pull-off's) and hybrid picking to it. In #033 it was all about a scale sequence of playing 3 notes up (down backwards) from each scale note. Works with any scale combined with a 3 note per string pattern. This time the idea is simply playing 4 notes up from each note of the scale. That changes the picking and fretting pattern of both hands, which makes it a new exercise. Adapting hybrid picking and left hand legato technique to this exercise, allows to gain more speed without effort. And of course it sounds different! In this video I'm referring to the scale sequence combined with hybrid picking and left hand legato technique I showed in my former Guitar-Nerdery episode #033 and apply two really wide stretched out, 3 note per string scale pattern to it. One of them stretches about 3 1/2 octaves. Now, that's gonna be a challenge! My hands are of regular size, but I've always been addicted to these extreme hand gymnastics to gain a better reach of my left hand. So here's the one waiting also for you - left hand control, muscle and stamina training, combined with great changes of positions. Let's conquer the fretboard! I've put the jamtrack of the intro clip of my Nerdery video #033 on my YouTube channel! The first half of the chord progression in this backing track is in G melodic minor and changes to E (harmonic) minor in the second half. It's not the easiest one to play to. When I'm showing the minor pentatonic scale to my students and explaining why it's a fantastic scale to begin with, I always make clear, that it misses two notes which could be wrong (no minor or major sixth & minor or major second), compared to the three minor modes of the ionian system. So if you have to play in minor there are not many cases where you can go wrong with it. This backing track is different and it won't work here most of the time, at least not in the first half! Both, melodic and harmonic minor have a major 7th and hereby contradict the minor 7th of the minor pentatonic. I thought you might like the challenge to play over a strange chord progression  Have fun! The new Guitar-Nerdery episode is primarily about left hand legato technique! Here is another exercise that I picked up from Vinnie Moore a long time ago. Originally meant for training alternate picking I'm going to apply left hand legato technique (hammer-ons and pull-offs) and hybrid picking to it. This way that scale-sequence lick gets a whole new sound and vibe and you can reach tremendous speed much easier. Just in case you wonder what strange stuff I'm playing in the intro clip, I'm improvising over a G melodic minor chord progression that evolves into E Aeolian / B HM5 (Phrygian dominant). A new Guitar-Nerdery episode is up! This episode is a continuation of my former episode! There I made an adaption of one of Vinnie Moore's alternate picking exercises and turned it into a hybrid picking exercise. This time, for all you studious Guitar-Nerdery followers  this exercise is going to be pushed to another level by incorporating string skipping and involving also the third finger of your picking hand. Adapting Guitar Techniques will be continued over a couple of videos! A happy new year and welcome back! After a short break I've restarted my Guitar-Nerdery series. Back then in the 80s of the last century I was fan of lots of them upcoming shred guitar players and Shrapnel Records heroes (Label owner Mike Varney) like Yngwie Malmsteen (he had no releases on the Shrapnel Label, but was supported by Mike Varney), Tony MacAlpine, Jason Becker, Marty Friedman... ...and one of them was Vinnie Moore. Without internet and YouTube guitar tutorials were available on good 'ol VHS tape. Vinnie Moore with his remarkable playing technique at that time released two guitar instructional videos and I was unbelievable happy having bought them. I studied everything and it had a great impact on my playing. That is all very long ago and since then I studied many different guitar playing techniques, left and right hand. There's an issue when it comes to learn a new technique, for example when first picking every note and then start to learn to play everything legato. You put a lot of time and energy into the new stuff and there's not so much time left to keep your "old" stuff in shape. The result is you find yourself playing your shreding licks not as persuasive as usually while the new technique still isn't your friend. That transition time can be very annoying. Anyway, that's the way it always goes and it this video I'd like to show you a hybrid picking exercise. When starting with hybrid picking I recommend to start with one finger additional to the plectrum first, probably the middle finger. The way I learn a new guitar playing technique is, I try to adapt that technique to the musical ideas I've already trained. This is the moment when Vinnie Moore and one of his exercises in his instructional videos comes in. It's originally an alternate picking exercise, a movement through a '3 notes per string' scale shape. Playing this with hybrid picking is a good muscle and overall control training for the plucking finger. The last day of the year and I've got some guitar playing for you. This video is an electric guitar performance and I'm playing a short composition of mine, which simply cristallized out of jamming. Those of you who follow my Guitar-Nerdery tutorial series will notice, that I've used some ideas and guitar techniques I've shown and explained in my first tutorial season. The title is my wish for 2019. I wish you all a Happy New Year! Unbelievable it's already tutorial nr. 30 and the last one this year, 2018! This guitar tutorial series takes a vacation and will be back on January the 10th in 2019! I mentioned more than once that in my opinion in music it's all about the rhythm and I'm finishing this year's season with another guitar rhythm lesson. Be sure that shredding guitar exercises won't be missed out in future, but without the right approach to rhythm everything is pointless. In this video we'll be creative with the regular 4/4 time signature and I first show you a guitar rhythm exercise that I missed to recommend in my former guitar rhythm lessons, the importance of practising offbeats, here with 16th notes. Furthermore it's gonna be fun when I refer to guitar rhythm concepts and exercises of my former videos, merging them and discover new grooves. Conform to what should always be your second thought - "What else can I do with it?" Al Di Meola is mostly known as a fast picking virtuoso, playing solo runs at light speed. Some 30 years ago I listened to the "Friday Night in San Francisco" album for the first time, the price winning live collaboration album of Al Di Meola, John McLaughlin and Paco de Lucia. Man I couldn't believe what I've heard! I became a fan of all three guitar players and tried to get more information and records. Somehow Al Di Meola's style attracted me the most and very soon I was also aware of his remarkable rhythm guitar playing and timing. Although playing with a plectrum, his grooves pretty much sounded like those of flamenco players. While having my problems trying to practise some of his grooves that I picked up by ear, and there was no Al Di Meola on Youtube these days, I noticed his different right-hand technique, different from what most other guitar players do when strumming - I could finally see him performing on regular tv. So I studied his right-hand and tried to copy it, also in front of a mirror  Yes, and it really worked for me! In this video I show you a specific guitar strumming pattern, inspired by Al Di Meola and that can help you to get a feel for his rhythm playing style. I wish you as much fun as I always have with these kind of exercises! Tapping octave harmonics - A very useful guitar trick! Tapping pinch harmonics or tapping artificial harmonics means, you get harmonics out by tapping an open or fretted string on specific points. I'm also calling this guitar technique Hot Plate Tapping, because the tap has to be pretty short, like you're tapping on a very hot plate. In this video I'm going to show you how you can play complete melodies and solo lines, just by tapping octave harmonics that are located 12 frets higher than those notes of the open or fretted strings. Means, you tap a copy of what your left hand is doing exactly 12 frets higher. It works everywhere on the guitar fretboard, but the higher you get, the more difficult it gets to get the octave harmonics out. One of the reasons is that the higher you get, the more precise you have to be, but it's also very supportive if your guitar is harmonic friendly. This does apply to both, acoustic and electric guitar. Using a guitar compressor or distortion (what is also a kind of compression) makes it also easier. On an overdriven electric guitar those tapped harmonics can sound as loud and last long as a played chord, what isn't the case on an acoustic guitar. This has to be taken into account when integrating octave harmonics into your playing and songs. There's more than just major. Major can have many different colors and metal riffs in major, that's very possible! All major scales of the ionian system - This time I'm talking about how to incorporate major scales Into riffs. In this video I show you how to transform an ionian major guitar riff into a lydian and mixolydian riff, only by making small, but important changes. For fully understanding it's important to watch my former episode "Create Riffs with Minor Scales - Guitar-Nerdery #026"! There I'm going very much into detail about the actual differences between scales and demonstrate how you can get the mode sound by using the exclusion principle. Take this video and my former one as a companion, for understanding all modal scales and practically building marvelous riffs in various minor and major colors! All minor scales of the ionian system - This video is about how to incorporate minor scales Into riffs. I'll show you how to transform an aeolian minor guitar riff into a dorian, phrygian and locrian riff, only by making small, but important changes. What is the difference between those scales? Which are the important notes you have to integrate in your riff to get the mode sound? Everything is gonna be covered! After analysing the scales I'm gonna demonstrate the different sounds of the minor modes, by using the same riff idea and the exclusion principle - how you can achieve to work out the beautiful different flavors of minor. Blues riffs anyway, but also rock riffs are very often built on the blues scale, the expansion of the minor pentatonic. Depending on the riff and because we have the same notes more than once on the guitar fretboard, we can use different shapes for the same thing. I'm gonna show you a shape of the E blues scale that works fantastic for riff building. In addition with one of the most important chords / voicings for the guitar player. The E7#9 or Jimi Hendrix chord! In my opinion there's no other instrument where that chord sounds that good. All examples with the guitar tuned to E standard. Very often my students ask me how to play metal guitar. My first answer would be it's all about the sound and right playing attitude. There's also a great element of sports to it which needs a lot of training. This answer only wouldn't satisfied them. Yeah what's a typical metal riff? In this video I'm gonna show you a picking pattern / exercise and chord / voicing progression, that I would definitely put on the table. All examples in standard E tuning. Most of the time the reason why drop-tunings are chosen is to want the guitar and riffs sound fatter. Inverted Power Chords with the perfect fifth on bottom in the standard e-tuning sound darker and fatter than regular power chords. They are a fantastic tool to fake a down-tuning, to let the guitar sound lower than it is tuned. In this video I'm gonna demonstrate how to play inverted power chords and how they sound. If you Google the term Drop B Tuning you'll find an equal to the Drop D Tuning. Tuning the whole guitar three half steps down to C# standard and then the low C# string further down a whole step to B. The instrument is then playable like in Drop D Tuning. I'm gonna show you a different Drop B Tuning that goes along with the idea, just to tune down the lowest string and keeping all other five strings in Standard E. This way the string tension and harmonic character almost stays the same, which I like! The guitar overall doesn't need any further adjustments then and it's very easy to tune back to Standard E Tuning, if you need that low Drop B Tuning only for a few songs. I like the drop D tuning, or dropped d tuning very much. You simply tune down the low E-string one whole tone down to D. By that simple step you tremendously expand the possibilities on the guitar. The first time I was aware of it was in the early ninties, when I tried to figure out the riffs of an Annihilator song. From then on I heard it more and more in Metal music. Nowadays Metal cannot be imagined without drop D tuning. Besides explaining what it's good for I show you a good way how to tune your guitar to drop D with harmonics. Unfortunately that tuning method doesn't work on guitars with a floating tremolo system - every change of tuning gets them completely out of tune. ...one of the reasons why I play guitars with fixed bridge! It's announced that Google is going to shut down Google+ sometime soon. Therefore I removed all Google+ links from my link list! ...don't wanna lead you to a dead end! Al Di Meola is known for his incredible picking technique when playing solos, but he is an outstanding rhythm guitar player too. When he plays his unique strumming pattern he uses a different right-hand technique that enables him to reach a very controlled fast tempo without losing punch, sounding a bit like a flamenco player using a plectrum. In this strumming guitar lesson I'll show you how to do that. In this video I'm gonna show you a way how triplet notes grooves are played on the guitar in Irish music. I also wanna recommend you to check out John Doyle and many other Irish guitar players like Sam Lakeman (Cara Dillon). New Guitar-Nerdery episode: The first thing that comes up to mind when talking about triplet notes is 8th note triplets. Quarter note triplets are not so much addressed, but they are pretty tough to play right. In the straight note world playing quarter notes is not a big deal, but quarter note triplets are actually 6 equally long notes over 4 straight quarter notes in a 4/4 time signature. That means you have 2 notes on count 1 and 3 or 2 and 4, but four of them quarter notes in the off-beat. I'm gonna show you how to play them right in time. I just wanna share an experience I had. I have been to the X-Fi Audioshow in Veldhoven, a great exposition for audio nerds and all about HiFi. High Fidelity, the capability of reproducing acoustical reality, when you forget the speakers and the only thing there is is the music. There is this small Dutch company daudio who build speakers without cabinets (dipole design) and in my opinion they completely nailed it! ...and there has been a lot of awesome stuff from other companies to compare it with, but daudio was beyond reach. If you're interested in HiFi check them out when they expose again. Just to know what's possible. New Guitar-Nerdery episode: A rhythm exercise you'll learn to hate! #017! #017 Odd time signatures? ...piece of cake! New Guitar-Nerdery episode: Odd time signatures? ...piece of cake! #016! Playing in odd time signatures, everybody can do that. No-one counts till 19, 17 or 13... It's all about subdivisions! Watch the whole video and get inspired by loads of demonstrations! #016 Odd time signatures? ...piece of cake! New Guitar-Nerdery episode: Cross-Rhythms, proggy tools for proggy songs #015! Cross rhythms are fun to play and very suitable if you need that proggy touch in your prog rock or prog metal songs, jazz tunes etc. Progressive music is often associated with playing in odd time signatures, making the listener guessing where the '1' of the beat is, hahaha. With cross rhythms you can achive that even in 4/4! Let's make the listeners wonder where the '1' is. But you, the player, should never lose it!!! PS: In the video I'm talking about 'rest notes' but mostly playing 8th instead in my demonstrations. In theory I wanted to keep it easily countable while my demonstrations with guitar focus more on how cross rhythms can be approached. New Guitar-Nerdery episode: How to Groove Like Hell in Odd Time Signatures #014! Hey hey, this is my first video ever lasting nearly 15 minutes! ...time for a toast ;-) In my last video I explained how important it is, to tap with your foot along with the metronome, to get the feel / groove right. All examples were in 4/4 time signature. But what if it's not 4/4, how can the same groove and feel be achieved? In this episode I show you how I deal with odd time signatures, how I manage to tap along. The video is packed with loads of demonstrations, beginning in 3/4 and ending pretty odd like 13/16! When you like the video, please support me and leave a comment, like and subscribe. If you got questions, suggestions or ideas, please send me a message! My new guitar-nerdery video is the first of a series of episodes, where I dive deep into guitar rhythm. Any kind of instrument player or singer, you need a few notes to make your statement or a lot - your message will only be delivered when you get your rhythm tight. The metronome is your friend to achieve that, but to tap along with your foot is essential for your success! And it can be fun! I'm gonna show you with the metronome set to 4/4 ! Guitar-Nerdery update: Once more and this time a very weird and crazy way to make use and extend that simple tapping lick, I've explained in my former two videos. Next time I'm gonna start a series of Nerdery videos about rhythm. For me a good timing and groove are the most important ingredients in music, the key to make sense of it all and get your whole body involved. New Nerdery video! Another, even easier example what you can do with a simple idea, to let it shine. Make sure you've watched my former Guitar-Nerdery video "simple tapping idea". like and subscribe my YouTube Channel! In this week Guitar-Nerdery video I'm showing my 16th-fitness-training. A great exercise for hands and brains. I did and do this regularly. I really like slide-guitar, but somehow always found an excuse not to work it out ;-) At least I found a way to integrate a little bit of that slide-flavor in my playing. By making this video I've learned that I use it a lot! A 4th Guitar-Nerdery video is up, String-Skipping-Arpeggios! There are many ways to play arpeggios on a guitar. Besides that different playing techniques sound different, they all have their own possibilities of phrasing. These string skipping arpeggios fit perfectly with right hand hybrid picking. A new Guitar-Nerdery video is up. I'm explaining a nice little country-rock riff. This guitar riff was the main inspiration for the chorus of my song "Lost In Yesterdays", which I recorded with New String Theory. 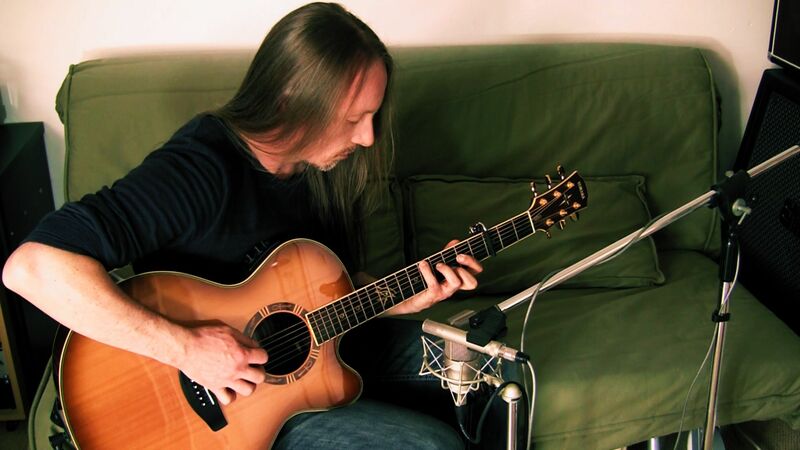 After being asked frequently, I happily put my first guitar video tutorial online. It´s meant to be the start of a regular updated tutorial series, which I've named Benjamin's Guitar-Nerdery. Here I'm explaining a favorite hybrid lick of mine, which I used a lot in my Song SMILE! A brand-new NST video is up, a hard rocking tune with some country rock riffing. Hello dear visitors and followers! 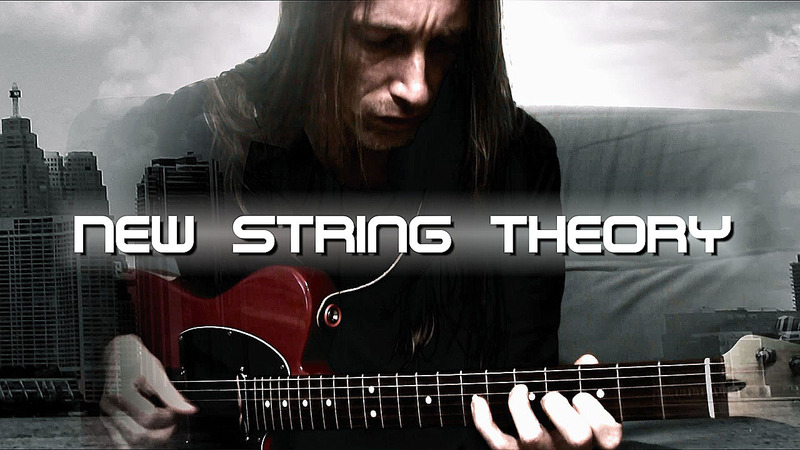 Currently I'm working on more songs for the New String Theory project. The recordings for our third tune are nearly done and then we're also going to produce a video. I really appreciate you liking my music and your kind comments, that what I'm doing means something to you! This it what keeps me going and I'd be much obliged, if you'd spread the word! ...furthermore there's something I'd like to mention here. Since quite some time I'm happily recording on Cakewalk Sonar Platinum, an awesome sounding and inspiring digital audio workstation. Cakewalk was taken over by Gibson in 2013 and there had been some rumors, that regarding Gibson's history in buying companys and dropping them very soon, that this would be no good. So, as a gift to Cakewalk's 30th anniversary and it's customers, Cakewalk got now the axe, flimsy excused! Very bad for Cakewalk's employees and customers. A kind of disaster for recording engineers, because it means changing to another DAW, get used to a hopefully not too different workflow, and mainly, what about all those projects recorded on Sonar? Without future updates, how long will the software be compatible and recording-projects be accessible? It means a load of work saving data and losing all mix settings anyway. Simply annoying Gibson, throws a great shadow over you! Enough with complaining! I've already switched to another DAW, to Samplitude Pro X3 and really start to like it very much. So, everything will be fine in the end! 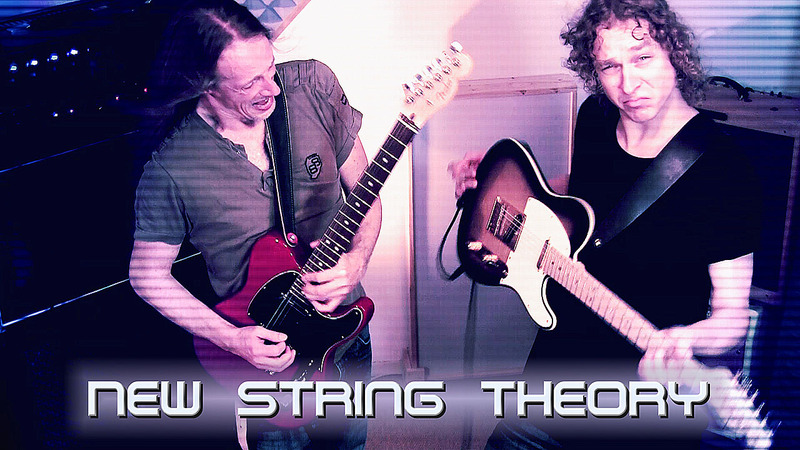 I'm happy to be able to present the first output of New String Theory, a re-recording, new arrangement and videoclip of my song Smile! ...and there is more to come! 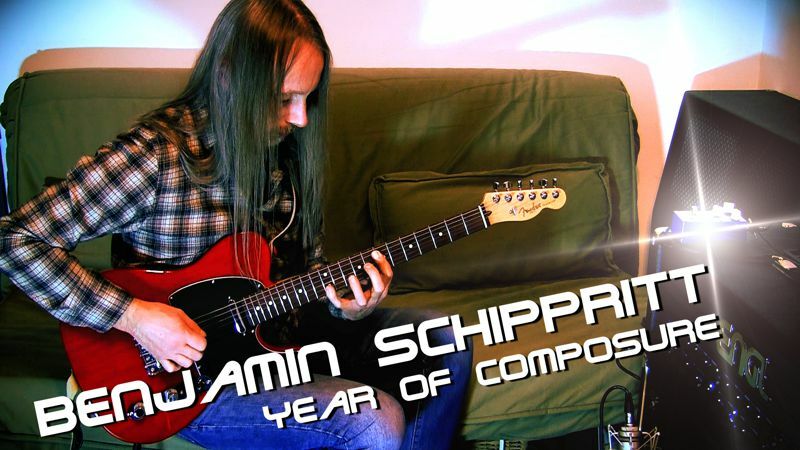 BENJAMIN SCHIPPRITT is an enthusiastic and passionate musician since 1983. His main instruments and base of musical thinking are the electric and western acoustic guitar, but he also enjoys singing and playing electric bass guitar, as well as producing, recording and mixing music in his studio. Spending a whole lifetime around his guitar, developing a virtuos playing style and completing a full-time jazz guitar study at the Institute for the Arts in The Netherlands, he always got a strong beating heart for rock music. His creative song-writing and contributions cover many different styles of music and manage to perfectly fit that rocking attitude. 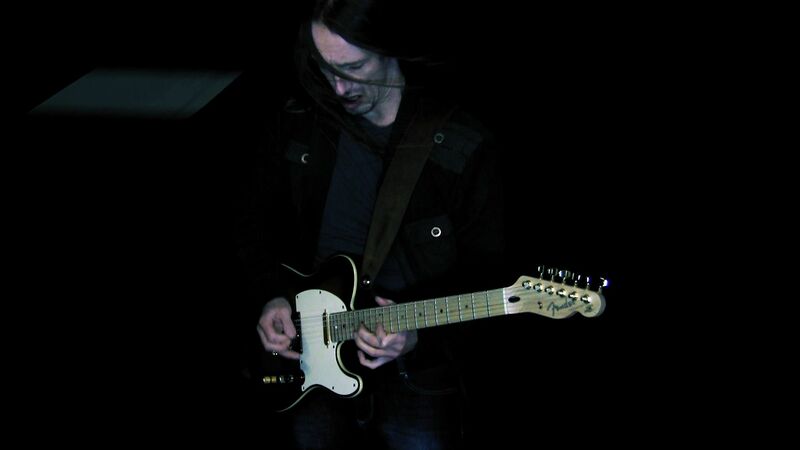 Besides being a live- and studio-musician, he's utterly passionate about guitar teaching. 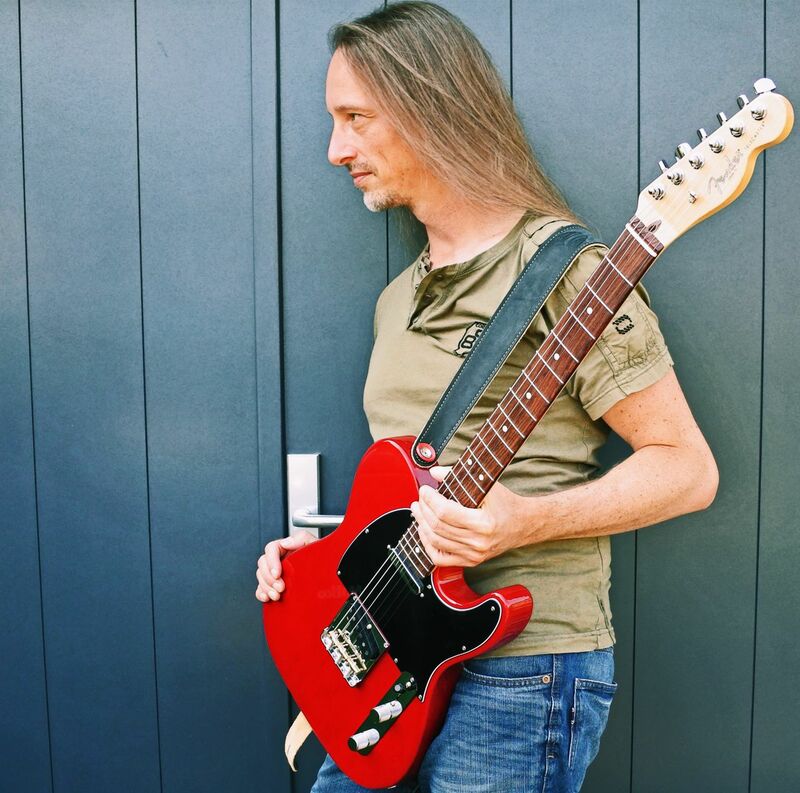 Born in Gelsenkirchen, a town in the industrial Ruhr district in western Germany, BENJAMIN started playing electric guitar at the age of 11 in 1983 when he lived in Hamburg. First inspired by Angus Young of AC/DC, in the mid 80s he was really blown away by guitarists like Yngwie Malmsteen and Vinnie Moore, and practiced many hours a day. 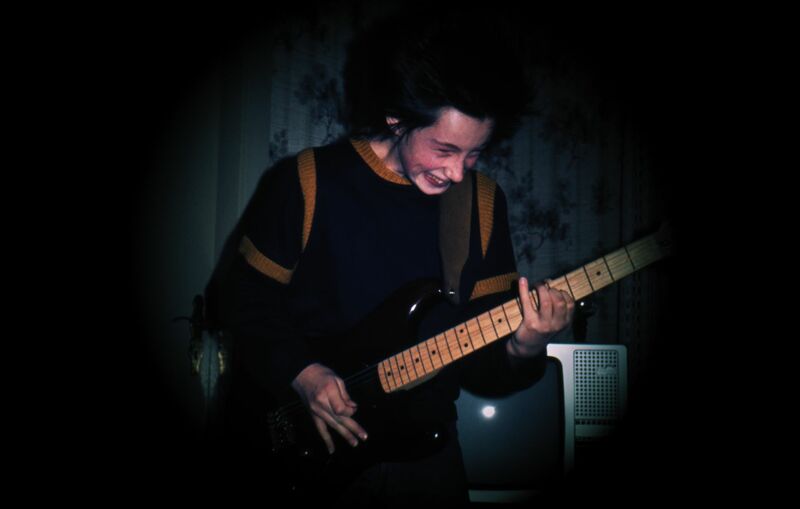 Very soon he formed his first hard rock schoolbands called FLANGER and HARD NOISE, and also a family band, with his father on bass guitar and mother on drums. In 1987 he started to record his first instrumental demo tape on a 4-track multitrack-recorder. Moving back to the Ruhr district, in 1990 BENJAMIN became a member of rock band SHINE DARK from Gladbeck for a short period of time. A year later his own heavy metal band TAILGUNNER was formed. They played lots of gigs in the Ruhr district and they won several band contests. A production of an album, which unfortunately never was completed followed. 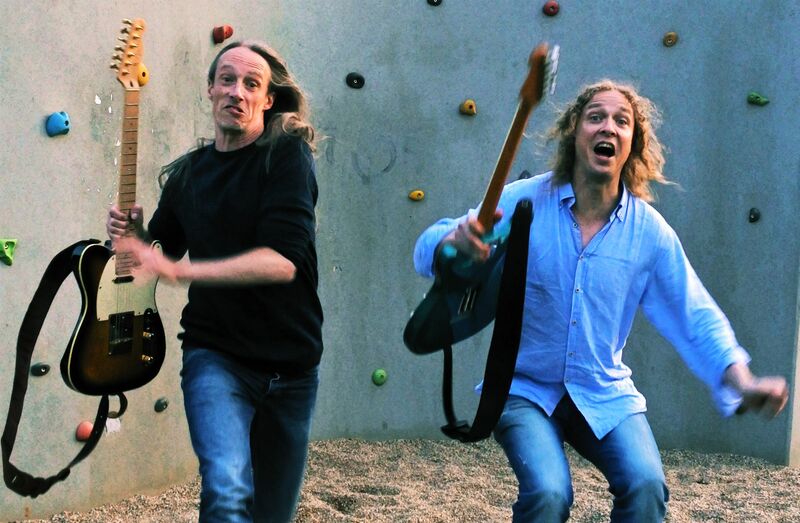 In 1993 those unfinished recordings however accidentally ended up in the hands of JÖRG MICHAEL, drummer of the German metal-band RUNNING WILD. At that time he was in the recording studio with his Art-Metal side-project HOUSE OF SPIRITS, recording an album and they were looking for a guitar player. 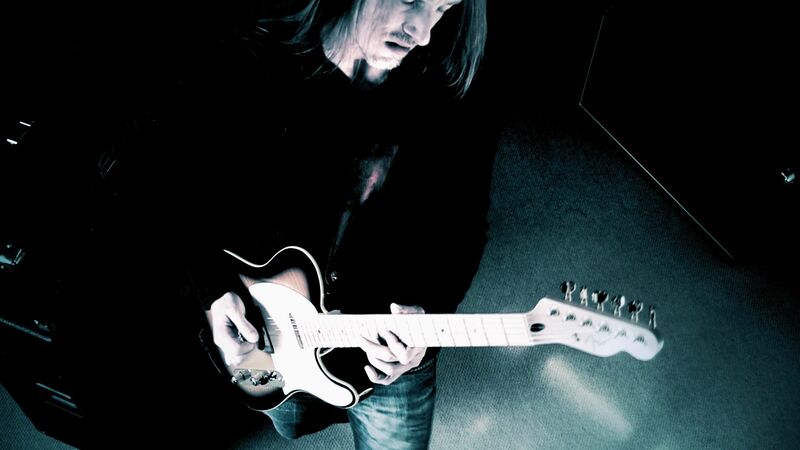 BENJAMIN joined the band and recorded two studio albums with them, besides working as a studio guitarist. In 1994 he recorded a 5-songs instrumental demo tape with his 8-track tape reel machine, and got jazz-guitar lessons from German guitarist ANDREAS WAHL. In 1996 he started a fulltime jazz-study at the INSTITUTE FOR THE ARTS ARNHEM in The Netherlands. 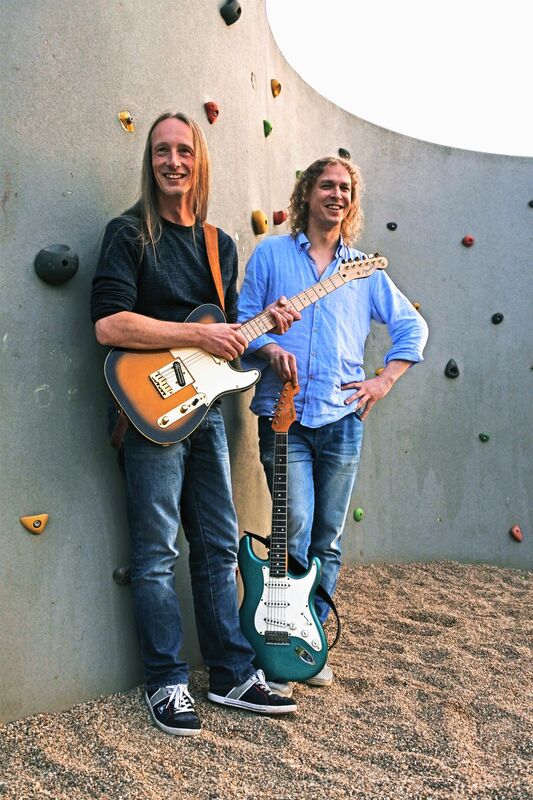 BENJAMIN's guitar teachers were ONNO KELK and FRANK SICHMANN and he learned more than he could ever imagine he would. During this time he was guitarist and composer of the projects LE VOYAGE NOIR (acoustic folk/pop), and ELVISBOY (hard rock). ELVISBOY recorded a complete album BETTER LEARN MY NAME of which BENJAMIN was the guitarist, bass-player, composer, arranger, producer and engineer. During his study in Arnhem, he founded the METAL-FUSION band ZPAWN with other students. In 2001 BENJAMIN also formed the FUSION TRIO FROM HELL - JUNK FARM and started with the idea to become also the vocalist of both bands. In 2005 Zpawn broke up, because none could find enough time to keep it going. 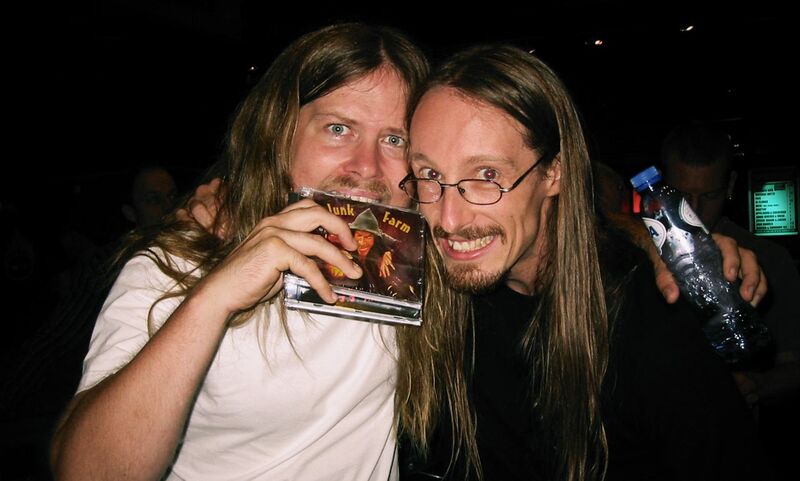 Junk Farm had the opportunity to support prog-metal-bands FATES WARNING and FREAK KITCHEN in 2005. In 2007 BENJAMIN signed at UNICORN DIGITAL INC., a Canadian progressive rock label, for a worldwide release of the Junk Farm album UGLY LITTLE THING. In 2009 they published their 2nd album DIDN'T COME TO DANCE. Since 2010 BENJAMIN lives in the Netherlands. Over the whole time BENJAMIN has given lots of guitar lessons and loves the opportunity to impart his knowledge about what you can do with six "magic" strings and his passion for music. Always amazed by realizing, that a lifetime is not enough to learn to play everything on that fantastic instrument. 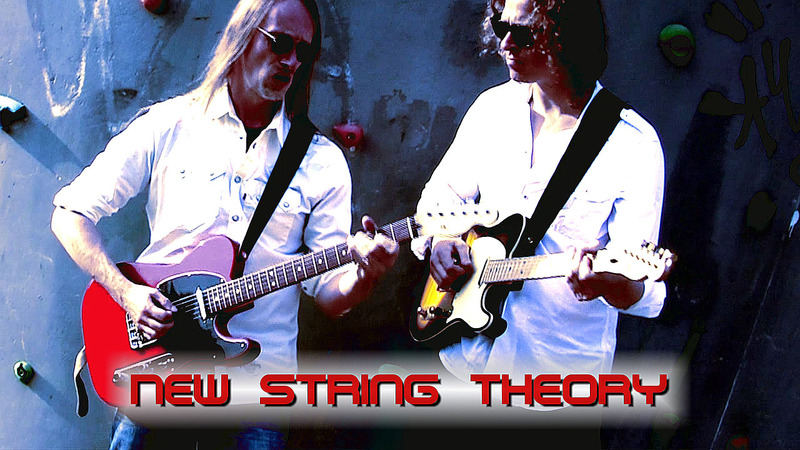 Since 2017 I produce and compose for my guitar-collaboration project New String Theory (NST). NST stands for tasty, dynamic guitar-adrenalin-driven (rock) music, never limited to the rock genre itself. Use links below to watch my videos on my official YouTube channel and listen to loads of songs on SoundCloud. To get the best audio quality on Youtube, switch videos to HD resolution! Updated every Thursday at 9pm GMT +1! with tons of tutorials and performance videos! Please like, subscribe and leave a comment! Der Verwalter dieser Website distanziert sich ausdrücklich von sämtlichen Inhalten aller fremden gelinkten Seiten auf dieser Homepage, und macht sich diese Inhalte nicht zu eigen. Für den Inhalt der verlinkten Seiten sind ausschließlich deren Betreiber verantwortlich! Diese Erklärung gilt für alle auf dieser Homepage angebrachten Links zu fremden Seiten! Der Betreiber aktualisiert die Informationen auf dieser Webseite ständig. Trotz aller Sorgfalt können sich Daten inzwischen verändert haben. Eine Haftung oder Garantie für die Aktualität, Richtigkeit und Vollständigkeit der zur Verfügung gestellten Informationen kann daher nicht übernommen werden! For questions of any kind please use e-mail above! Languages, Sprachen, Talen: English, Deutsch & Nederlands. Voor informatie over Gitaarles in Nijmegen met Benjamin: stuur vragen aan bovenstaand e-mailadres!